Bagley Road, Wellington, Somerset TA21 9PZ. Faithful Somerset duo, Alain Lockyer, with his camera and Richard Walsh, with his pen, have combined again to bring out another joyful book on Somerset CCC’s more recent and successful exploits. Their previous book, The Glory Years, recounted Somerset cricket in probably their heyday, 1983 to 1987, whilst The Return to Glory concentrates on 2001 to 2007 when they once again became a force to be reckoned with. I have to admit to a soft spot for Somerset CCC having first seen the Taunton ground from a wall at night during a school theatre visit around 1980. ( During the second of three acts at the theatre near the ground...). Vic Marks,a Somerset stalwart and great servant of the club was one of my teachers and my old school, Blundell’s, has a very impressive room overlooking the playing area in the Ondaatje Pavilion where Ted Crowe, another former master, host extraordinaire and legend at the Taunton ground, reigned supreme until his death in 2008. So for me, Somerset cricket has happy memories and it is always lovely seeing new books appearing and being published by presumably the West Country’s leading publishers, Halsgrove. This pictorial history features photos of players mostly in red and blue clothing but, for the more traditional, there are photos of players in whites. Somerset’s rehabilitation at the turn of the century led to their lifting the Cheltenham and Gloucester Trophy in 2001 under the guidance of Australian, Jamie Cox. Indeed, Australian players have made the long journey over to ply their trade in the West Country: Cox, Ricky Ponting and Justin Langer have all proved of enormous benefit in helping Somerset although the focal player during the coverage of The Return to Glory was South African captain, Graeme Smith. It’s not just about the international stars, though. Much is made of the day Somerset beat the Australians in 2005 in a one-day match with Smith and Sanath Jayasuriya making hundreds but the talent closer to home is given a fair mention. Some names may be a little further back in the memory, others will be instantly recognisable and it is nice to see photos of all staff members for the seasons concerned. It gives a reminder of those who played for Somerset before, in certain cases, moving on and those who rendered loyal service until their retirement. It is fun to enjoy the photos and remember the many decent players and people who have represented the West Country side. This isn’t a book for statistics. It is a fun and happy recollection of a decent county cricket club reliving an era when they returned close to their heady days of the mid-80s. It is touching to see that non-players including committee members and fans have their own section and Halsgrove have once again done an impeccable job. 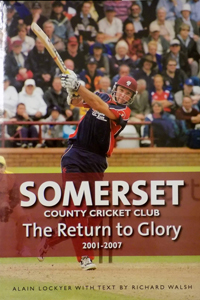 In a way it would have been nice had the book included the largely successful 2010 and 2011 seasons to make a full decade from 2001 but maybe those latter years will be remembered as Somerset being the bridesmaids rather than the brides. This large format book will undoubtedly appeal to all Somerset fans and indeed any self-respecting county cricket fan alike.